At 7:30am on Thursday morning, Baldersby Park is eerily quiet. Surrounded by peaceful, undisturbed countryside, at first glance, one might question whether this tranquil landscape could really transform into a bustling festival hub overnight. Take a closer look, however, and the constant flurry of human activity tells a different story. 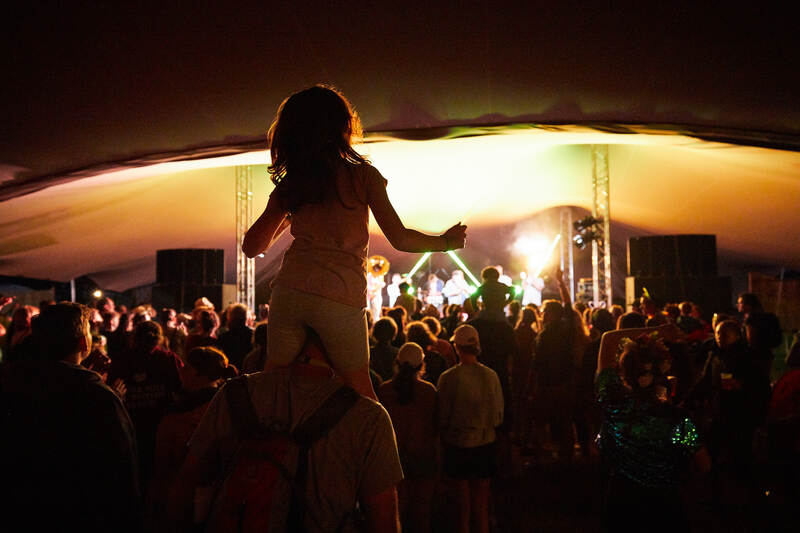 Celebrating its ninth anniversary, Deer Shed is an independent, family-oriented festival boasting a delightful line-up of music, comedy, science and arts. It’s undoubtedly one-of-a-kind. Offering up a tasty selection of events that cater to both younger and older generations, Deer Shed ticks all the boxes. The gender-balanced line-up (tick), the eco-friendly ethos (tick) and the wallet-friendly tickets (tick) make Deer Shed a diamond in the rough. Working at a festival is always a different experience to being a punter. There’s less alcohol, for starters, not to mention having to do the nine-to-five while simultaneously living in a tent. It can be tough. What is great about working is that it sheds an interesting light on the sheer effort that goes into making any festival a success, and Deer Shed is no different. In the days running up to the festival, the atmosphere backstage is tense but organised. The dedicated team of staff, some who have worked on this for months, some who have worked a few days, put in serious graft day and night to ensure the weekend is the best it possibly can be. Despite working every day, in between my shifts as ‘Workshop Runner 3’ I managed to catch a few of the main music highlights. Friday night at the Dock Stage saw the infamous HMLTD give a wonderfully freaky performance. Fast rising stars of the London underground scene, the group are flamboyant and vogueish. Every show is an opulent, high-octane display of colour and sound. Reeling off some of the old favourites interwoven with new singles, HMLTD unashamedly invited the audience to lose themselves to their genre-bending music. 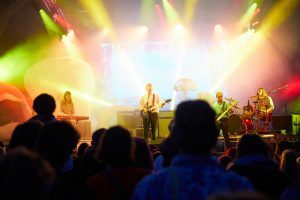 Drenge gave an equally energetic performance on the Main Stage, made even more spectacular by their efforts to embrace the ‘making waves’ theme this year. In between offering up a giant, inflatable octopus as a Tinder date and swimming on for their encore sporting DIY oxygen tanks, the band gave a grungy, energetic performance that left the audience smiling. For those wishing to partake in some extra-musicular fun, there was a plethora of different activities available. For the culture vultures, there were arts and crafts workshops for all ages and thought-provoking literary talks, while the restless adventurers could canoe on the lake or wander into The Wilderwild. Several people were seen donning their running kits and taking leisurely jogs around the festival site, including Alison Goldfrapp, who was rumoured to have gone for a run flanked by four security guards. Serious business indeed. Saturday proved to be another spectacular day. A highlight came in the form of comedian James Acaster, performing his PG-rated set beneath the unflinching eyes of an audience of five-year-olds. Considering his self-proclaimed imminent failure, Acaster gave a stellar performance. Never veering from his dry, sardonic persona, James moved between personally blaming the children for Britain’s current political climate and berating the parents for being privileged stoners. Much to everyone’s delight, he was heckled into rounding off the set with an improvised song about socks. Throughout the weekend, we were never too far away from the bubbling sound of trombones, trumpets and saxophones. The Hyde Park Brass Ensemble, a staple of any festival line-up, bounced between the crowds giving brassy renditions of popular favourites. Always on the look-out for a good bit of banter, the lads from Leeds ascended into the trees on Sunday night to give their final farewell performance. On Saturday night, Public Service Broadcasting, the cool musicians masquerading as friendly neighbourhood geeks, gave an intimate show of songs old and new. It was hard not to tear up during their heartfelt performance of ‘They Gave Me A Lamp’. Big hit ‘Progress’, from the same album, was equally as uplifting. It would be sacrilegious not to mention the spectacular flash mob that occurred during ‘Go!’, in which hundreds of people young and old united in an impressive display of synchronised air punching. 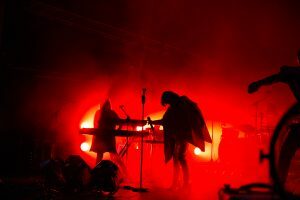 In what can be described as possibly the most highly anticipated gig in Deer Shed’s history, Goldfrapp headlined on Saturday night. Doused in a passionate red glow, Alison’s silhouette flew about the stage wrapped in an ethereal red cape. The whole experience was verging on magical, with Alison telling the audience: “You’re all so beautiful”. Although every song was as fantastic as the last, ‘Ride a White Horse’ and ‘Ooh La La’ from 2005’s Supernature definitely received the most vocal response. Where there would usually be sequin-clad women dancing on the shoulders of their friends, at Deer Shed there are sequin-clad children on the shoulders of their parents, doing an arguably more enthusiastic job of throwing down some serious dance moves. During Goldfrapp there were dozens of young’uns thrusting their arms to the sky and giving it all. Not only is the sight incredibly endearing, it also brings a fresh perspective to festival culture. No drugs, no alcohol, just a bunch of kids having a damn good time. Sunday came around much too quickly and it was all over way too fast. Although I didn’t manage to catch Field Music’s closing performance, Holy Moly & The Crackers gave a fantastic closing set on the Dock Stage. Jazzy, funky and suave, the gravelly voice of Conrad Bird combined with the soulful, flawless vocals of Ruth Patterson make Holy Moly an incredible band to see live. It was the perfect way to round off a fantastic weekend.